This week’s Tenant of the Week ! I was lucky enough to learn how to sew in my middle school and have more or less kept it up over the years. 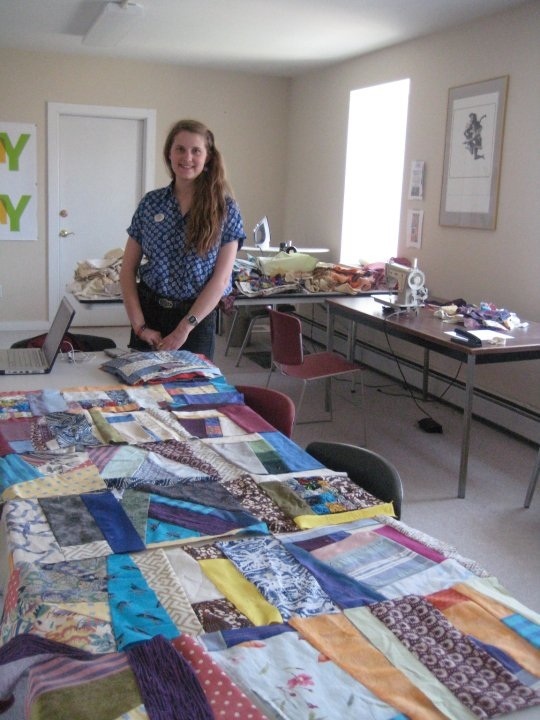 Last summer, I started making a quilt for myself and brought my sewing machine to school with the intent of finishing the quilt during the school year. That did not happen, but as people commented on my old Singer machine and expressed interest in learning how to sew, I had a new idea. I contacted the costume department at the CFA about creating an abstract quilt out of recycled fabric. They willingly donated a massive amount of fabric they were going to otherwise throw out as well as a second sewing machine. I set up my space at the Old Stone Mill, put up signs around campus, and sent out a bunch of e-mails. Throughout the semester, about 10 volunteers came down to learn how to sew (if they didn’t know already) and help me make my quilt. We had a lot of fun, and I’m really pleased with the way the quilt came out. It’s truly the product of many fabrics and many hands. It will be put on display in The Grille sometime next week! This entry was posted in Uncategorized on April 15, 2010 by Kyle Hunter. I should mention that Casey’s quilt is now done and is going to be displayed in McCullough shortly. Look out for it!